After the state Attorney General’s office initiative called Project Medicine Drop first arose with a pilot program in November 2011, residents of the state were provided an outlet by which they could anonymously drop off unwanted prescription drugs. Adopting this idea, Moorestown announced on Tuesday, Aug. 16 that it has installed a box of its own at police headquarters. Situated in the police department’s lobby, located at 1245 N. Church St., Suite 3, the box can be used to rid oneself of drugs that are either expired, unwanted or unused. This effort to fight against the nation-wide opiate and heroin abuse also seeks to help protect the environment by keeping these drugs out of landfills and the water supply and ultimately to continue to make Moorestown a safer, healthier and stronger community. According to Project Medicine Drop, for too many New Jerseyans, addiction begins in the medicine cabinet. The initiative additionally informs the public that in June 2011, the New Jersey State Commission of Investigation reported that a growing number of young people were abusing prescription drugs, and noted a significant trend in which the practice has led to increases, not only in the number of young people addicted to painkillers but to the number of young people using heroin as well. “Any prescription drug that can be kept out of the wrong hands and disposed of properly will help to fight the nationwide epidemic. The more people that take advantage of this project, the more lives can be potentially saved,” Lieber said. Hoping to encourage increased use of the drop box, as of Jan. 1, prescribers and pharmacies have been required to provide a notice about the drug take back programs to each patient upon dispensing a controlled dangerous substance prescription medication. With this safety in mind, Project Medicine Drop has mandated that boxes can only accept solid medications such as pills, patches, inhalers and similar objects. Additionally, the boxes cannot accept liquids, medical waste or syringes, but consumers wishing to dispose of these objects should speak with their doctors or pharmacists to find the safest and best ways to do so. Consumers can only dispose of legal prescription or over-the-counter medications. Anyone wishing to dispose of any illicit drug should follow the normal procedure of reporting it to the police. Residents will be able to drop off prescription and over-the-counter medicines 24/7/365. However, after regular business hours, they will have to utilize the blue call box outside the front door to have an officer respond and assist them. 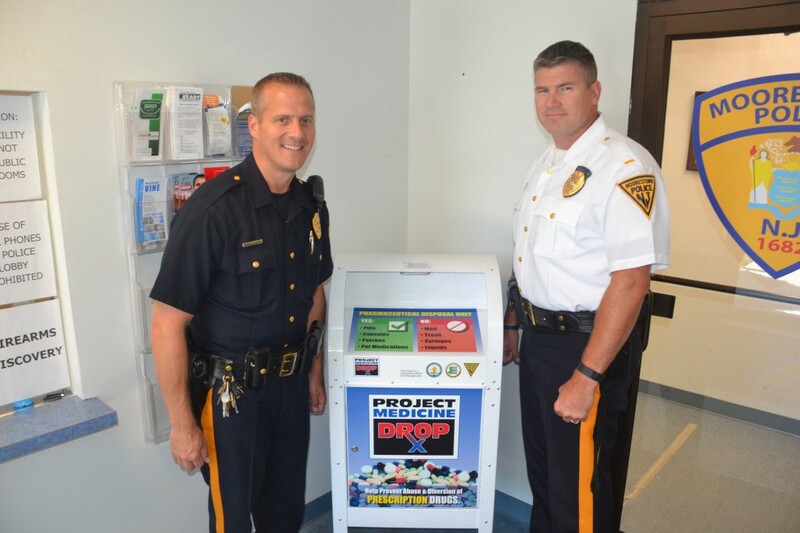 “When a permanently mounted collection box became available, mounted at police headquarters, it was the obvious next step to take, making it easier for our residents and neighbors to properly dispose of unwanted medications throughout the year at their convenience,” Lieber said. For more information on Project Medicine Drop, visit www.NJConsumerAffairs.gov/meddrop or contact Douglas S. Collier, drug initiative coordinator at the N.J. Division of Consumer Affairs, at (800) 242–5846.